What happens when nothing happens? 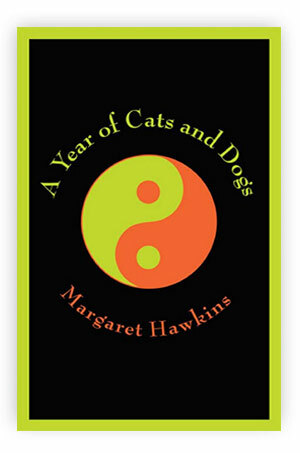 Maryanne wonders in A Year of Cats and Dogs, a darkly funny yet hopeful novel about a woman in midlife who feels surrounded by death. She answers her own question by deciding to find out. "I wanted to embrace entropy, to stop working so hard at keeping things up, to go AWOL from the productive world I d so long been a part of, she tells us at the beginning of the novel. The clearer it became that Phillip wasn t coming back the more I wanted to hurry up and let things go just to see what would happen." As it turns out, a lot happens. Even as Maryanne's world slows down and comes apart, curious revelations begin to emerge about the daily life she's formerly taken for granted. She discovers she can hear the thoughts of animals, starting with her own opinionated dog and cat. Then the veterinarian at the animal shelter where she volunteers offers her a job as a dog whisperer and asks her on a date to his mother s funeral. When her father falls ill she is reunited with her estranged sister and when he dies they learn about his secret life. The book contains recipes for the consoling, if plain, foods Maryanne cooks for her family and friends, along with the inner dialog that accompanies them, and each chapter is linked to a corresponding chapter in the I Ching, reflecting that book's age-old wisdom that says that sometimes no action is the best action of all. Hawkins, a Chicago critic and writer, has a fashioned a first novel that deftly traces the eruption and easing of emotional incoherence, while addressing serious questions of life and death with jaunty and edgy humor not unlike that of best-selling Jennifer Weiner. Hawkins seamlessly weaves together many eclectic elements: soup recipes, I Ching meditations, bits of maudlin poetry, a pet's simple request for toast, the heartache of death. You don't have to be an animal lover to enjoy this funny and moving debut novel. I relished this quirky, sparkling novel.